When I began my first year of service as a volunteer in mission with Project Salud Y Paz (SyP) this past March, I had no idea how God would connect the dots between my passion for justice—not simply charity, and my Wesleyan call to “look upon all the world as my parish.” I am now five months into a two year commitment to serve as the resource coordinator at SyP’s Susanna Wesley School, which offers a comprehensive early education, nutrition, medical, and dental program to indigenous Mayan children in the rural area of Camanchaj, Guatemala. Although I arrived with very little knowledge of the country, what I have come to learn about Guatemala is that the people and the culture cannot be homogenized with a broad brush, but that the country’s multi-faceted and multi-dimensional diversity and complexities arise out of a particular historical context that must be acknowledged. This historical context of colonialism, civil war, and foreign interference has created the systemic oppression, ethnic discrimination, and social inequality that persist today—the intersectionality and global nature of which, I am sensitive to as an African-American and a Methodist serving abroad during a time of heightened racial tension in my own country. Interestingly, it has been an intentional and ongoing process for me to come to terms with what it means for me to serve in another culture as someone who rejects the historical missionary baggage of elevating American culture. In rejecting the missionary baggage of hierarchy, I embrace a passion for justice, which is an orientation towards a “power with” approach that values other cultures and engages their inherent agency. Through the eyes of justice and the Kingdom of God, we are all equal partners who bring different gifts to bear, but in the eyes of charity, one is elevated over the “other” based primarily on access to resources and the other is relegated to a handout. Fortunately, SyP is an organization that works intentionally to engage and empower the agency of Guatemalans as partners in the transformation of their communities. However, there are many nonprofits that approach their work from a charity standpoint which only increases the disparities, disempowers the people, and “buries” the talents and tenacity of the Mayan people that are integral to long-term solutions. As an African-American, similar to the Mayans in Guatemala, I am part of a historically oppressed group in my own country, and the descendant of ancestors whose African culture has been decimated. The indigenous Mayans, which represent the largest culture in Guatemala with at least 23 groups—each with their own distinct dialect, are the most marginalized culture in the country. SyP works with the indigenous Mayans who speak K’iche, which is the first language of the students of the Susanna Wesley School—most of whom enter the program with little command of the country’s official language—Spanish. Therefore, the school helps prepare these pre-kindergartners to first graders for the Spanish-speaking public school system—educationally, spiritually, and morally. As part of their education, they learn about different values each month at “acto civico” presentations, and this month’s presentation was a celebration of diversity that introduced the four cultures: the indigenous Mayans—the largest cultural group with at least 23 dialects; the Garifunas—the Black Caribs who live along the coast; the Xinca—the non-Mayan indigenous people who live in the southern portion of Guatemala; and the Ladinos—the non-indigenous Spanish-speaking and often westernized Guatemalans and mestizos. Beyond the diversity of languages and cultures, the country also has diverse religious and political affiliations with everything from indigenous Mayan religions and Catholicism to a diversity of Protestant faiths, as well as a political playing field with over 20 registered parties. Paradoxically, although I am also part of an oppressed “other” group that is still fighting for racial justice in America, I am considered a member of the “dominant” American culture here. As the “other” group in Guatemala, Mayans are viewed as inferior by the Ladinos, while as one of the “other” groups in America, African-Americans have been historically and falsely viewed wholesale as drug dealers, rapists, and criminals—language that is now being projected onto Mexicans and by extension other Latin Americans in current American politics. This “other”-ing of people to paint groups with broad brushes of inferiority as a means to secure one’s own identity of superiority is deeply racist, discriminatory, oppressive, and unbiblical. If you disagree with that statement, consider the fact that the largest segment of domestic terrorism in America is committed by groups of white people, but no one is “other”–ing all white people as terrorists. So, although I am part of the “dominant” American culture, I do not benefit from the same privilege that white people do. Likewise, the Mayans are part of this Guatemalan culture, but do not necessarily benefit from the same privileges as Ladinos—not because they are disparately flawed but because they are disparately oppressed. The reality is that people of all groups are deeply flawed and at the same time possess great divine potential. There are diverse cultures in Guatemala, and there are also diverse cultures in America—some naturally formed and some unnaturally and violently forced into being and into subjugation. Out of these historical contexts, there exists deep and far-reaching disparities between cultural groups both here in Guatemala, and in America. There also exists great opportunities in every context to confront the global realities of systemic oppression, ethnic discrimination, and social inequality in order to shift from the tendency towards charity and worldly hierarchy to a propensity towards justice and the Kingdom of God. LaShawn Seabrook is a lay member of Union Memorial UMC in Greensboro. 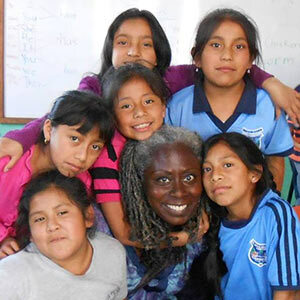 Her two-year stint as the resource coordinator at the Susannah Wesley School is in connection with The General Board of Global Ministries and was partially funded by the WNCC Justice and Reconciliation Team. Prior to accepting this position in Guatemala, LaShawn was the Campus Minister at NC A&T University.